While drip irrigation is popular in drought-prone areas since it cuts down on water waste, it can help gardeners in any area control water usage, trim their water bill spending, and water trees and shrubs on a consistent schedule. Drip irrigation works best for small to medium trees. To camouflage the black plastic tubing, cover it with mulch--but don't cover over the emitter so the tree can receive water. Drip irrigation allows for regular watering of landscape trees and shrubs, including fruit trees, developing trees and mature trees. Drip irrigation provides a slow, steady stream of water to give your tree the moisture it needs without wasting water. If you have two homes, or travel frequently, an irrigation system with a timer allows regular watering of your trees to keep them healthy. The exact amount of irrigation any tree needs depends on its size and the type of soil it's planted in. Sandy soil absorbs more water than clay soil, so require more watering to drench the soil and thereby the tree roots. Utah State University Extension advises watering trees to a soil depth of 18 to 20 inches and notes this corresponds to a broad range of 5 to 50 gallons (for a tree with a trunk diameter of 4 inches or less) using drip irrigation. When setting up a drip irrigation system that waters trees, you need to ensure the irrigation tubing passes over the tree roots, which grow over time as the tree grows larger. Colorado State University warns against using drop emitters for trees that are taller than 25 feet, since they need so much water that a drip system becomes impractical. It would need to be on all the time to provide sufficient water. While tree irrigation needs change as trees grow, Colorado State University suggests starting young trees with a 1-inch trunk diameter with three drip emitters at a 2-gallon-per-hour rate or a tree with a 2-inch trunk diameter at three 4-gallon-per-hour emitters. 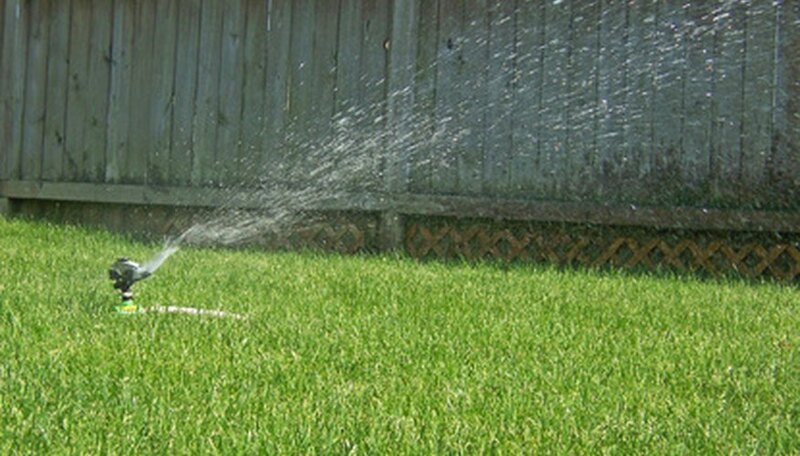 Hire professionals to install drip irrigation or do it yourself in an afternoon. Lay irrigation tubing out along the path, linking all trees together or irrigating the garden beds and trees in the backyard to the same system. Stake down your irrigation tube every 2 feet with wire stakes. To set an emitter, puncture the tubing with a plastic hole punch or a knife, then stick the emitter into the tubing.